Facebook wants to make it as easy as possible to get you to share Open Graph actions since the new Timeline announcement downplayed “Likes.” Action verbs and phrases like “Watch” or “Want to” are just as important as Likes – and much more revealing and specific. 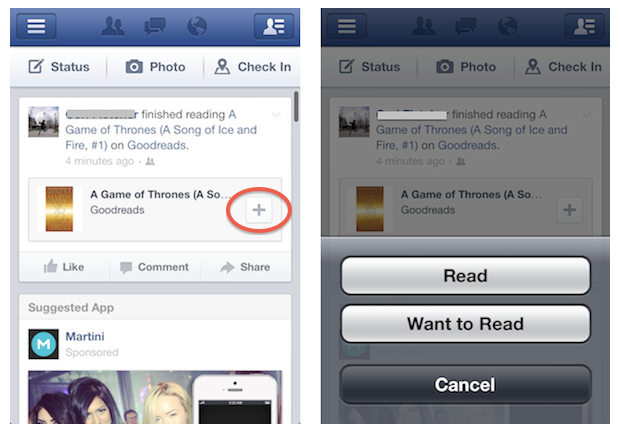 Not surprisingly, you’ll start seeing these actions in the mobile app, as Inside Facebook has noticed. For every Open Graph action-oriented story that pops up in the News Feed inside of Facebook’s mobile app, a “plus” button that sits next to the story’s description enables you to quickly add that book, movie, TV show, or other media right to your own list of interests and experiences. For instance if you tap on the “plus” button from a story that says your friend has read a book, the options for “Read” and “Want to Read” slide open, as you can see in the screenshot at top. And for those of you with the new Timeline, you’ll find that your mobile app has been synced with the changes so your “About” page looks pretty similar to the Web app. Not only can friends view the modules for TV-shows, Movies, and Books found inside of the “About” tab on the mobile app, but they can also add your “Watched” movies, or books you “Want to read” to their own collection of media. These small additions to the platform should get users to share what they’re watching and reading, and even what they’re listening to since adding this data to your collection is just a tap away. It’s becoming apparent that Facebook is trying to get a better sense of what your interests are. As we’ve reported earlier, “Likes” just aren’t a great indicator for gauging what you actually care about and consume. These specific Open Graph actions and respective modules should, however, should give Facebook far more relevant data to work with.